Like so many other movies at this years /slash Filmfestival, “Office” actually starts off quite strong, only to ultimately disappoint. It also would have had the potential to deal with some interesting and important issues, like mobbing, or the heavy pressure that people feel in a highly competitive work place. Unfortunately, “Office” touches those subjects far too fleetingly, and mostly uses them as excuse for a thriller set in a typical office space. The first half or so actually was quite good. Hong Won-Chan knows how to create tension, and he really puts the cube office-setting to great use for that. Personally, I don’t work in one of those, but he still successfully manages to bring the terror to a rather generic, dull and common place, which definitely had its charm. He also includes a couple of beautiful shots here and there, and overall gives this movie a nice, creepy atmosphere. And to sum up the good parts, I quite liked Ah-sung Ko’s performance. Unfortunately, after the nice setup, once the twist comes around, I couldn’t take this movie serious anymore, since what started off as a rather down-to-earth thriller actually unveils itself to be a ghost/possession-story. And I simply wasn’t willing to go along with that. Seriously, “Office” could have been quite a good movie if they would have simply revealed Lee Mi-Rye as the killer (after the cops find the suspect in the elevator shaft and determine that he’s been dead for days). Instead, she’s kinda possessed by Kim Byong-gook’s ghost, and to add insult to injury, when she kills someone, they can actually see him! That was just far too silly for me. It’s a shame, really. If they would have put more emphasis on the mobbing-part and/or the pressure of the competitive working environment, and simply would have revealed her as the killer all along, we would have a decent thriller on our hands. As it is, the movie – which already wasn’t that special and/or great in the first place – completely lost me with this reveal. Afterwards, it was just a drag, and – pretty much like when you’re sitting in the office, waiting for quitting time – I couldn’t wait for it to be over. 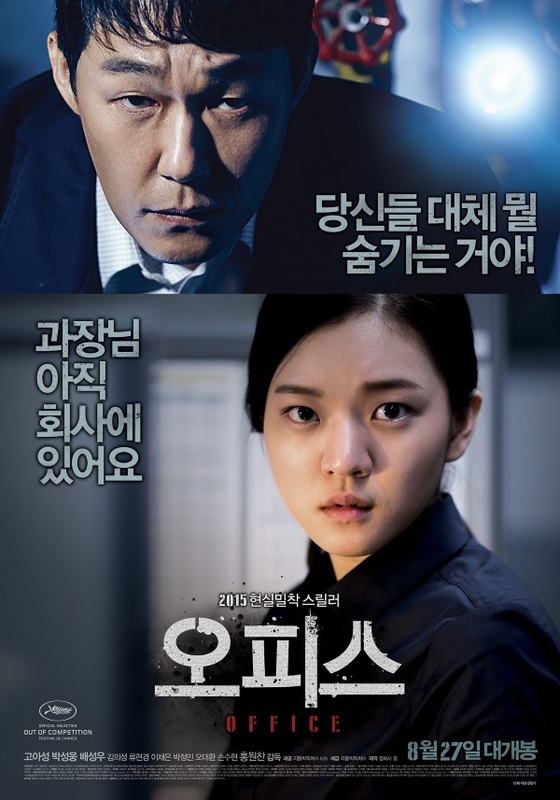 This entry was posted in /slash, movie reviews, new releases and tagged /slash, /slash 2015, Ah-sung Ko, Eui-sung Kim, Hong Won-Chan, O Piseu, office, Seong-woo Bae, South Korea, Sung Woong Park, thriller. Bookmark the permalink.